Marvin bought his father pretty new ties for Father’s Day. Now he needs a little help before they can be gift-wrapped. The patterns on the ties are incomplete. 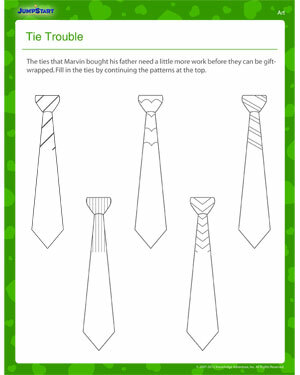 Help Marvin by completing the pattern on each tie. ‘Tie Trouble’ is a Father’s Day worksheet for first graders. Help your six year old develop his artistic skills by replicating the simple patterns on the ties.